Sant Miquel is a leading LUX-camp that can be found set in an enchanting vineyard in the beautiful Costa Brava region of Spain. 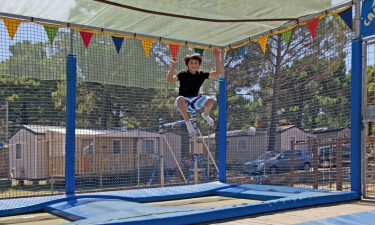 People who want to soak up the sun during their camping holiday will find that the site comes complete with an excellent range of facilities as well as mobile homes to rent featuring a wide range of modern amenities. What Makes Sant Miquel So Special? Fans of water-based fun have plenty of opportunities to go wet and wild during their stay at Sant Miquel. Visitors who want to try scuba diving and snorkelling will be able to arrange lessons during their stay, while kayak hire is also available here. Special aqua aerobics classes are arranged in the onsite pool in the summer months and taking these classes is the perfect way to keep fit while having fun. The kids are sure to find that there is plenty to do and they will love spending time exploring the colourful children’s play area. A special children’s club is arranged to take place during the daytime, offering plenty of activities for the kids to take part in, while a separate club is offered to teenagers featuring a range of adventure activities such as kayaking as well as workshops where teenagers can learn interesting new skills. Adults will be able to spend time simply lounging in their luxury tent while the kids are busy having fun. The picturesque site makes the perfect setting for those who want to do as little as possible and spend their days simply soaking up the scenery. Regular yoga classes are also held here for visitors who want to enjoy pure relaxation, while spending time in the Jacuzzi is a great way to soothe aching muscles. 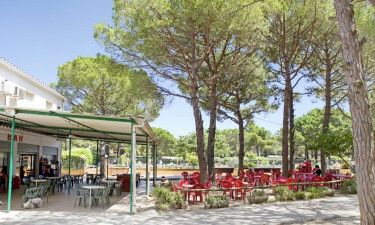 This luxury camping site boasts an excellent restaurant where guests can sample some of the dishes that are famous in this part of Spain such as Paella cooked with freshly caught seafood. Naturally, anyone renting a bungalow tent at Sant Miquel will also want to sample the wine that is produced right on the site and is served both in the restaurant and at the bar. Live music is also provided in the evening as well as a range of other types of entertainment for guests to enjoy. Freshly baked bread is available every morning at the onsite supermarket as well as a wide range of different types of fresh local produce such as cured sausages and ham. Guests will find everything they need to put together a picnic for their family to eat at the beach, while the snack bar also serves a range of tasty treats that people of all ages will want to indulge in.